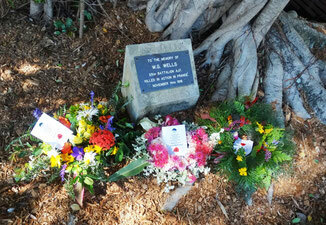 Wilfred Wells was known to his family as Wilf was born in Berry in New South Wales. Wilf only spent a short amount of time in Eumundi and was living independently of his parents, working as a saddle maker and harness maker. 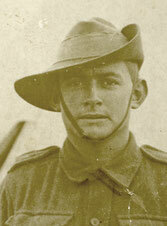 At only 18 years old Wells embarked from Sydney on board the RMS Mooltan on 12 April 1916. He was quite a short man but he always referred to himself as 'His Lordship'. He sent a photograph of himself to his family calling himself Your Lordship from Salisbury England. He was killed in action on 14 November 1916 and with no known grave he is remembered at the Villers-Bretonneux Memorial France. Ron Lawrence (Wells nephew) remembered visiting Eumundi as a boy and being with his grandmother and going to the Methodist Church. She never mentioned the tree to Ron or looked at it directly across the road from the church.